The mild temperatures that brought freezing rain to the Montreal area created a slippery mess on every street and made getting around treacherous -- and as the temperature drops, it's forming a skating rink over the city. The temperature reached a high of 3C before 7 a.m. As the temperature rose, the accumulation turned street corners into small lakes, as pedestrians tried to navigate the flooded, slushy streets. The temperature fell throughout the day, reaching the freezing point around dinnertime before dropping to a low of -11C, or -18C with the wind chill overnight. “As temperatures drop, expect things to freeze up,” said Graham. Despite the very slippery streets, police and paramedics are not reporting a higher than average number of injuries -- they say people seem to be staying home. The city said it's doing its best to remove puddles and ensure streets and sidewalks are salted so that ice doesn't build up as the temperature falls. Said Montreal Mayor Valerie Plante: "We're racing against the clock at this point." Friday should be mostly dry with a few flurries. The bitter cold returns: the morning will see temperatures of -11C (-18C with the wind) and it could rise to -6 at the warmest before dropping to -21 Friday night. A high of -14 is predicted for Saturday. The icy streets led to the closures of schools across the Laurentians, Montreal, and the Eastern Townships. A freezing rain warning was in effect for the Island of Montreal, Laval and the South Shore until midday Thursday before it headed over to Central and Eastern Quebec. From Wednesday into Thursday 5 to 15 millimetres of rain fell, often turning into ice as it accumulated. This made walking and driving very difficult and police and authorities reported a large number of crashes and collisions. One man was spotted on video falling twice on Guy St. at Argyle, and luckily the driver was able to stop in time to avoid hitting him. The driver is then seen getting out of his car to assist the man -- and he then fall too before coming to his aid. The video was sent to CTV by Asif Khan, who said the elderly gentleman was able to get up after one minute before police arrived at the scene to assist him. 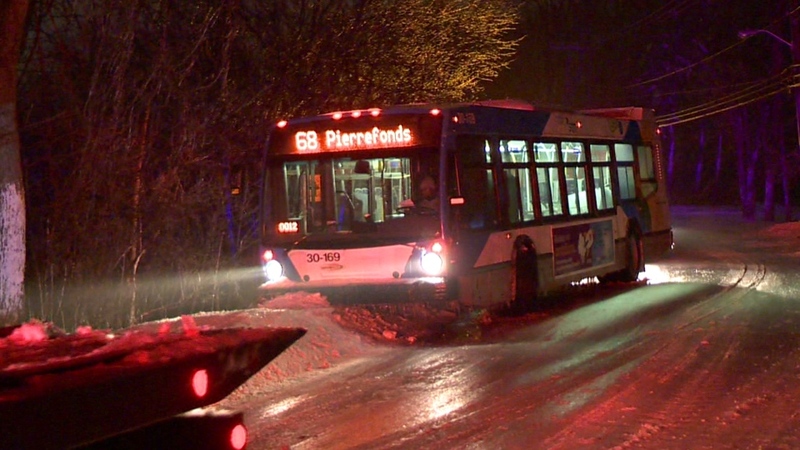 Around 1 a.m. Thursday a bus skidded off the road on Gouin Blvd. 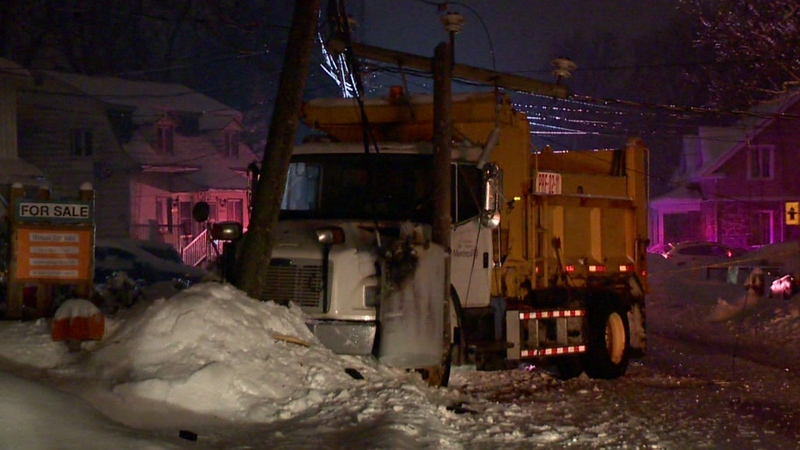 near Cap Saint Jacques in Pierrefonds, while nearby a dump truck smashed into a Hydro pole. On Thursday morning the entrances to Highway 15 South from Nuns' Island were closed because of a bus crash. Many bus routes were re-routed because drivers could not make it up hills. Among the STM bus lines affected are the 107, 94, 45, and 196. The 144 bus on Pine Ave. flooded Thursday at 10 a.m. near the Molson-Percival Stadium. See this video taken by Sydney Shantz. Trains were also affected by the ice, with many lines facing delays of 20 minutes or more. 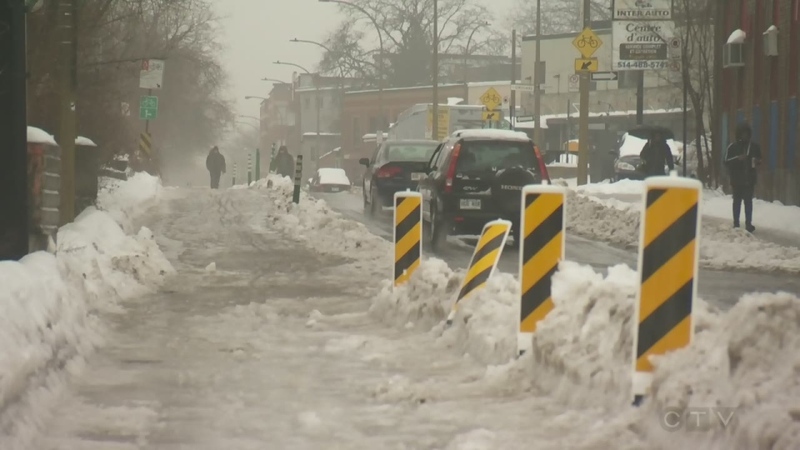 Cleaning up the mess will take more time than usual: because of the many school and CPE closures, many employees in Montreal who would normally be clearing snow and ice are not working Thursday. "I think it's difficult for parents to be at work today so it's the same thing for our blue collars," said Dorais. "It's difficult with fewer employees than we expect." The city also took many workers off snow removal duty to direct them instead toward clearing and spreading abrasives on sidewalks. The city of Gatineau also issued a notice Thursday that crews were not able to collect garbage and compost. The situation is so bad, with so many people calling for help, that Urgences Santé put out a plea: don't call 9-1-1 unless absolutely necessary. "Our paramedics and dispatchers will be working furiously [on Thursday]! That is why we are asking that you call 9-1-1 only if a life is in danger," said Urgences Santé. The agency told people to call the Health information line, Info Santé, at 8-1-1, and to avoid going outside as much as possible. 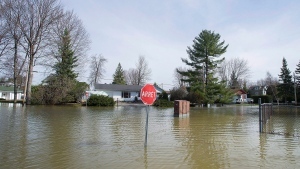 A rainfall warning remains in effect for the Eastern Townships and the Beauce region. With a daytime high of 9C there Thursday, as much as 15mm are expected to fall in the evening before changing over to snow. “Of course the ground is frozen, so the ground may not be able to absorb all of the rain that about to fall, and we could be looking at localized flooding,” said Graham.